The Milwaukee Journal Sentinel has informed Milwaukee County it will no longer rent a press office at the courthouse. So there will no longer be a beat reporter on the scene covering county government. Back in 2001, when the newspaper was scooped on the county pension scandal (by yours truly), the editors vowed they would never be caught not covering the county again. They assigned one of their best reporters, Dave Umhoefer, to cover the county, and he won a Pulitzer Prize for a smaller follow-up story on the pension problems I had first reported. But by 2014 the paper’s county coverage again fell off the map after Umhoefer’s full-time successor on the beat, Steve Schultze, left the paper. In the last year or so Don Behm has covered the county, but rarely does more than a couple stories a month. It’s become a part-time beat. “I haven’t seen a reporter walk out of that press office in more than a year,” says one county insider. The newspaper has also informed the city it will no longer rent the pressroom office in City Hall. The city was once the newspaper’s most important beat, but that hasn’t been true for nearly two decades. Certainly, you can watch any city or county hearings remotely, but the idea of a beat reporter was that he or she could get nose-to-nose with sources, see how officials interacted, and capture the atmosphere and dynamics of the place where all the action occurred. The Journal Sentinel also plans to vacate the office it has long rented in Madison for reporters, but will still have two reporters covering state government from the capitol building press office. It’s all about cutting costs. This is but one of the many signs of shrinkage at the Journal Sentinel. The disappearance of the paper’s historic archive of stories going back more than a century, and the subsequent news that the public library would have to pay $1.5 million for the archive, suggested new JS owner Gannett was ready to squeeze every dollar it could out of the paper. The newspaper used to be able to choose from the best syndicated reporting for its national coverage, but a couple of years ago stopped running stories by the New York Times. That may have been both to save money and look less liberal, but it’s meant it no longer publishes some of the best national reporting. That wouldn’t be so bad if it meant the paper ran more local coverage, but the opposite is the case. There is less coverage of the city, county, suburbs and state government, less business coverage and much less coverage of local arts and entertainment. Now that the paper is owned by Gannett, we get lots of USA Today’s national stories, typically inferior to those by the Times or Washington Post. And some of the paper’s “local” coverage is picked up from other Gannet papers writing something about Wisconsin. Only the paper’s sports coverage remains robust, and continues to create their most popular stories. The Journal Sentinel’s new website, styled after Gannett’s many other newspapers, feels more like a lifestyle publication than a daily newspaper. Clearly the company’s marketing gurus have found that lighter fare gets more clicks and so that’s the emphasis. Compared to the print Journal Sentinel, where big news still gets big play, the website feels like the place where news stories go to die. The old jsonline news feed, which every politician in town checked several times a day, is gone, and it can be a maddening task trying to find a particular news story. Almost despite this, the paper still does some good watchdog stories. The recent series on oil pipelines in the Great Lakes by Dan Egan was a revelation, and a good read, rare for the paper’s investigative stories. And the series by Cary Spivak and Kevin Crowe on bad landlords who rip off the city was good reporting and a real service to the community. But the paper’s once wide-ranging, one-man political dirt patrol, Dan Bice, is now an infrequent column that mostly covers Sheriff David Clarke. And the recent departure of business reporter Kathleen Gallagher, one of the paper’s handful of Pulitzer winners, was a bad sign. Meanwhile, the paper’s readership and revenue have been plummeting. As I reported back in 2012, the paper’s circulation has been in a free fall: the Sunday paper went from 466,000 subscribers in the mid-1990s to just over 299,000 in 2012, while the daily paper dropped even more drastically, from 328,000 to about 175,600. Meanwhile, publishing revenue for Journal Communications dropped by 48 percent in just five years, from $328.5 million in 2006 to $170.9 million in 2011. More recent circulation figures show the Journal Sentinel combined print and digital daily circulation in 2015 was 154,763 while another analysis shows the digital portion of the daily paid readership numbered 38,499 subscribers. All told, it looks like the daily print subscribers have dropped from 328,000 in the mid-1990s to about 116,000 by 2015, with just over 38,000 people switching to a digital subscription. If the Journal Sentinel was once the 800-pound gorilla of state journalism, its disappearing readership suggests the beast is now half that size and losing more heft rapidly. Perhaps nothing shouts out desperation more than the editors’ decision to bring back the old Milwaukee Journal Green Sheet after an absence of more than two decades, complete with stories it reruns by long-dead contributors like Ione Quinby (Mrs) Griggs, discussing the oh-so-current personal issues of people from several decades ago, and venerable humorist Gerald Kloss. This no doubt cheered the senior citizens who fondly remember those writers, but any readers under the age of 45 must be completely mystified. Yet the paper hasn’t bottomed out yet. The Gannett deal, I’m told, included a promise not to cut staff for a year, which means layoffs of more reporters could be coming in April. Given how few news stories are now published, it’s hard to imagine there isn’t a purge of personnel coming. 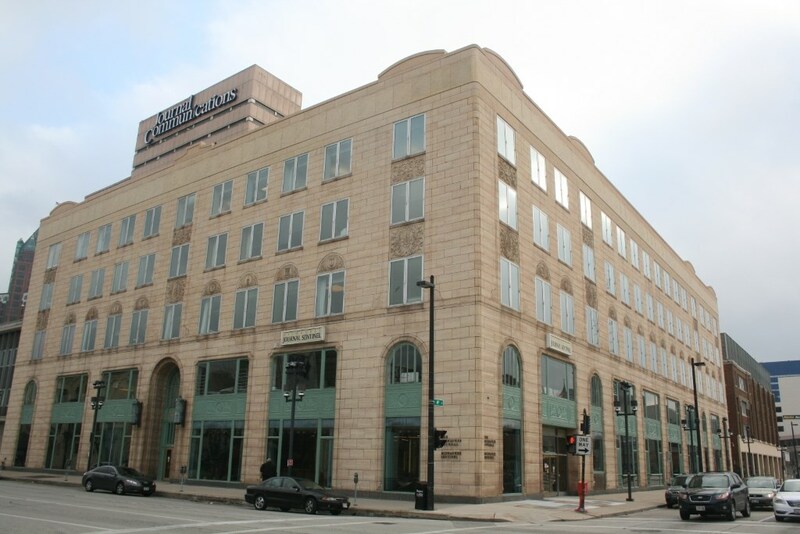 The sale of the Journal Sentinel building also seems likely at some point: most of the building is now empty and the shrinking staff could be housed far more economically. I still read the paper daily, but know many people who no longer subscribe, which would have unthinkable a decade ago. How the mighty have fallen. If Mrs. Griggs and Gerald Kloss are for the senior citizens, just what the hell is Jim Stingl there for? Quirky white people with lots of stuff in their closets? No wonder the MJS has its problems moving into the digital age. WiFi has nothing to do with news gathering. It connects your smart thermostat of speakers to your computer. Oh wait, who am I kidding? The shrinkage reflects a sad and dangerous nationwide trend, which has not only affected intense city and county coverage but also loss of attention to statehouses. This is partly because of indifferent readership, but that is now triumphing over what the purpose of journalism was supposed to be. I sense a pickup in genuine internet news sites, not fake news, and a rebirth of not for profit journalism. But it could lead to more fake news that people believe. It’s sad and alarming to watch the slow death of the JS. “The Death & Life of American Journalism” (co-written by John Nichols of Madison’s Cap Times and The Nation) lays out what will happen to democracy if the slide of journalism, including coverage of state and local government, continues. It sets up a perfect storm for corruption and Orwellian nightmares. Without ongoing scrutiny, including of the banal goings-on of government, politicians can act without the public having a clue about what they’re doing. Sunshine laws are useless without anyone on the beat. The “fourth estate” may be protected by the U.S. Constitution but that means nothing if rigorous journalism ceases to exist and is replaced by pablum. Let’s hope nature abhors a vacuum and somehow serious journalism gets reborn. I hope urbanmilwaukee.com will continue to grow and fill this essential, empty niche. Meanwhile, the Journal Sentinel employs something like seven, full-time Packers reporters. The opiate of the people. Recently, the MJS decided to drop the printing of high school box scores as an austere move. These are the young readers looking for some exposure, and now it’s been drastically curtailed. Obviously, management feels that these are not the advertiser-readers they desire, hence, gone are the box scores. I used to deliver sports (golf) information to the sports department…traversing through the desk arrangements for more than 35 sports people on the 4th floor. Now, there’s fewer than 6 people during their shift. How long will the MJS be around to “service” the readers of our community? Yes, it’s sad, but it’s all right, though. The days of print newspapers are coming to an end. Although the JS is also losing value in its online edition, there are more options online for news than I can ever remember. You just have to adjust to new sites and sift through the viewpoints. This site is one of those choices. I can’t share your indifference mbradleyc. What news sites are you talking about? Even if the JS is shrinking, sites like this don’t have their staff or resources. So who fills the gaps when it comes to local and state news when there’s no more JS? Or do you imagine a robust online JS that provides adequate local and state news coverage? Journalism was one of the time honored professions, and schools like UWM had career path coursework in this area. Sadly it seems to be a dying profession with virtually no entry job market potential. During the 1950s in grade school, we learned the art of who, what, why, where, when and how as a defender of truth, justice, rights, and an educated Democratic Republic. We are left to seek alternative forms of news that is relevant like Urban Milwaukee, Mother Jones, that provide online information and some print. Wait, I know this one: Mr. Green, in the library, with the revolver. Is it possible that when the decision makers at JS decided the Milwaukee on their masthead was not relevant anymore, they decided their audience was WOW country and thus became irrelevant to many in the city? I think this is one reason for sure. It is no surprise that a journalism organization that promotes ideology over principled journalism would fail. The propaganda most employed by MJS was omission of factual information and opinions up the wazoo. I am very happy that I had to find journalism elsewhere. Good luck to you folks at urbanmilwaukee. I enjoy your reporting. Virginia hit the nail on the head. Without an active press, who is going to be watching the politicians and government workers, searching for incompetence and corruption? I am a lawyer who has done civil rights work over my long career. I recall filing a civil rights lawsuit against Milwaukee County and the state late on a Friday afternoon in the federal courthouse in the early 70s. The Sentinel reporter who was assigned full time to the federal courthouse read the complaint I was filing, and then read me the riot act for filing the lawsuit late on a Friday, telling me that I wasn’t giving her sufficient time to write and submit a thorough article about the case for the next day’s paper, and that no one reads Saturday’s papers anyway! If I wanted the J/S to cover the same case today, I would have to call the paper, try to chase down a reporter, and then fax or email a copy of the filing to him or her, and explain what the case was about.. On the positive side, in addition to the good reporters mentioned by Bruce in his article, the J/S still has Meg Kissinger who is old school and digs deep to find the truth. She has written great articles covering, among other things, the mental health system in Milwaukee County and the lack of care and inhuman conditions in the women’s prison at Taycheedah. To be fair, the courthouse office dates back to the days before live streaming. Even when JS had a full-time staffer on the county beat, the reporter did more and more reporting watching the live-stream rather then showing-up. But it is not the same, the whisper in the back of the room, or an off-the cuff statement in the lobby can direct a tireless reporter to dig further and find the obfuscation hidden from the canned comments. This kind of work is rarely being done. As for the municipalities and coverage of the 19 common councils in Milwaukee County, there is no reporting unless it is self-reporting my the elected officials, hardly balanced. Reality TV now means fiction; alternative facts means lies, and newspaper reporters dedicated to finding the truth are being crucified by our Commander-in-Chief just like Pilot washing his hands with his throw away line, Truth? What’s Truth? These changes really aren’t surprising. Daily newspapers in general are struggling, no matter who owns them. And anyone who knows anything about Gannett knows that there will be more cuts. That’s their business model of at least the last decade. Cut and consolidate. I’d bet money that when the April moratorium on staff cuts comes around, there will be more buyouts and/or layoffs, which only serves to dilute their product even more. I’d also bet money that they eventually close the Lake Country NOW suburban newsrooms in Waukesha. Bruce, you’re wrong about the old online newsfeed. It’s still there functioning the same as it did in the right rail. It’s called Newswatch. Just read the Wisconsin Conservative Digest of up to date news. That you can trust. I still read the ghost of the J/S almost every morning, but I routinely turn the radio to NPR before I start reading. Sometimes a # of NPR bits keep my attention before I find anything of interest in the J/S. Reading what is left of this city’s only daily paper can feel like walking through a ghost town, especially on Saturdays when there is no opinion page. That said, I agree with Bruce that the series on pipelines and the GREAT LAKES was good reading and telling writing. Kudos to Alderman Kovac for appreciating the presence of the press at City Hall. I wish the Trump people had his understanding of the value of journalism to democracy. As long as the JS keeps giving a paycheck to right-wing hacks like Christian Schneider and giving unlimited column inches to any Bradley Foundation-paid hack, there is no reason for me to give them a dime. They know this state is crooked, but they’re too in deep with the oligarchy that they don’t want to tell the truth. So I gave money to this site instead. Add in the long-overdue addition of liberal talk radio, and maybe there are finally small steps being taken toward balancing a media landscape that has been far too right-wing a regressive in the state’s biggest and most vital market. I read the J/S daily and appreciate what news I glean. The LTE’s and opinion page(s) keeps me connected to those with whom I agree and with those with whom I disagree – both necessary for understanding of where we are and where to go. For the rest I rely on the internet and wider reading. The internet?? ?…it is even more fragile than print if you ask me and until we reach F. 451 my wider reading seems the safest. As a former beat reporter myself, covering local government, police & education for the Waukesha Freeman where I crossed paths with the Journal & Sentinel reporters there at the Courthouse & elsewhere similarly assigned, I can say modern wi-fi has no bearing on the need for interaction with & observation of the local politicos & officials, & contacts cultivated over time. So I am put off by yet another Journal Sentinel cost-cutting measure, as reported by Bruce Murphy in his thoughtful investigation of the paper’s decline. I doubt whether the Gannett organization, in its apparent plan to milk & possibly abandon the JS, cares about some other measures it took that I feel led to its great decline in value & circulation, but I’ll note that an early tip-off — along with a loss of appeal from the buyout of talent, especially columnists & feature writers (such as in the entertaining ed page feature & discontinued Sunday supplements) — was the slashing of the editorial cartoonist spot, once a Pulitzer Prize-winning staple & a necessity for a first-rate news publication. And did they think no one would notice the abandonment of the vital statistics function, the birth, marriage, divorce & police/court records relied on by many readers as their only easily available source & the mark of the only local daily paper of record? Only paid death notices, presumably profitable, remain, while the output of the remaining writers of obituaries — though still accomplished, as is all the remaining staff — seems severley limited. Even syndicated material — along with the outstsanding photography once pioneered by the old Journal & its rotogravure section — has dwindled to insignificance, as Murphy points out. But another, less-known factor in the decline of subscriptions beyond the inevitable changes in readership habits in the TV & Internet age, but one reversible by Gannett, may be the horrendous public service offered by the circulation department. As only one reader I can’t speak to a general problem of deliveries, if there is one, but though my building may offer a somewhat difficult situation, it is on the East Side just north of Downtown & posed no challenge for the first 25 years of my residence, so I suspect my experience today may not be so rare. I’ll spare readers some details, but for the last year, in a Milwaukee Housing Authority building for the elderly & disabled, 20 stories in height, for at least 2 times a week, or over 100 times, I have had to complain about papers undelivered or left on the sidewalk outside in the elements, often unmarked as to apartment numbers, for anyone to pilfer or trash (& our disabled tenants include those with mental impairments). Often, it is old ladies in wheel chairs who have to get themselves down to look for their deliveries multiple times each morning, though I do my best to retrieve & deliver them first. Since the building is secure, with a locked lobby, there is a procedure to gain access that numerous businesses follow with permanent or temporary entrance cards (& an office that is open for conventional hours weekdays). Suffice it to say that one recalcitrant carrier refused to avail herself of a new card once it had been lost, unwilling to submit to a background check as all residents & others have done, & the situation rapidly degenerated. To this day I am constantly reassured by the JS customer service department that the matter will be taken care of — while the balky carrier has moved on — but deliveries are as unpredictable as ever. In the meantime, subscriptions have dropped from a high of about 80 (as I was told) to a handful, some of them, at least, specifically because of poor service. A return to the days when my paper would arrive at my apartment door on time each morning would be delightful — though I am fully immersed in the computer age & maintain my own website, for which I report, & can view the e-version — but at least getting it into the lobby would be an achievement for the Gannett people & might help maintain their disappearing base, as I & others still savor the feel & convenience of the printed word on paper. As someone who has appeared in a variety of regional & alternative papers, including some owned by the Journal Co., & even in the old Journal & Sentinel publications, I hate to see the market shrink as rapidly as it has been, aggravated by a visible loss of quality & service. I searched for a way to correct the misspelling of “severely” above, but can find no edit function. Can something be done about this problem? With Trump and his dissemblers in the White House, waging war on the media. we are in uncharted waters. Major media not bothering to cover important city, county and state beats well or at all ultimately has the same effect. The combination of those expendable liberal readers deserting JS over the propping up and cheerleading for Walker, and Charlie Sykes’ active campaign to get conservatives to jump ship, has resulted in the not surprising numbers quoted in the article. Charlie must be so proud. I’m one of those expendable liberal readers. That’s why I wrote it. JS has made it clear that we are expendable in its constant attempts to attract WOW readers who have nothing but contempt for what they consider a liberal rag – a paper that endorsed Walker repeatedly is a liberal rag in their minds, and Charlie Sykes made sure they continued to think that way. We went elsewhere and found other sources of information – like the Guardian which actually did some deep reporting on John Doe. And the JS is where it is because of that. So basically daily papers are suffering because of hyper-partisanship. Liberals think the paper is too conservative so they cancel their subscriptions. Conservatives think it’s too liberal so they do the same. I hate to think of myself as hyper-partisan. I just know that I can’t go to the JS for consistent long term coverage of what’s happening in Wisconsin, and the editorial page, with the exception of last year’s attempt by Walker & Co. to kill open records (an issue that directly affected them), has yet to get to the point where they are strongly calling out damaging decisions, appointments and legislation. I get my information elsewhere because I’ve had to look elsewhere. Sue sums it up well. The JS’s corporate interests and decision to stick with no-judgment “news” allowed the right-wing lie machine to get away with falsities, and it degraded the paper. That’s not hyperpartisanship, that’s an admission of facts (and admonishing the paper for not admitting what facts are). The only time the J-S decided to step up and take a side by telling the truth was when it directly involved in the open records fiasco, and their reasoning was sooo transparent. They KNOW better, but they keep funneling paychecks to Schneider and allowing things to continue unimpeded in this state instead of doing their jobs and reporting reality. And now Gannett is cutting costs to make that level of knowledgable reporting even less likely. By contrast, righties don’t like the J-S because of the fear that they MIGHT report reality, and then denigrate it so they don’t have to deal with what they might report…which “works the refs” in such a way that the J-S is intimidated by the oligarch crowd/lie machine, and continues to put out an inferior, no-judgment product. It’s like a vacation for our ears and our eyes! For the record, I do not think the JS is liberal at all. They have written several editorials critical of Walker, not just on open records, but every time they do so I think “yeah great thanks for endorsing him twice.” I think they definitely lean right. I’m just saying they are caught up in today’s hyper-partisanship, where liberals and conservatives each see bias and act accordingly. It’s probably happening to a lot of daily papers. But yeah I don’t feel sympathy for the JS so much as sadness. I wish we had a great daily paper worth championing loudly and proudly. Schneider is awful and an embarrassment, but there are 1-2 right-wing opinion columns on a daily basis so it’s hardly just him. WILL gets what feels like several columns a week. And WCD accuses others of racism on a near-daily basis here. WOW In one way this is sad. I started with the Milwaukee Journal as a newspaper boy in 1955. I had in large part read the paper on a daily basis till that fateful day when they supported Walker. I canceled my subscription and have not bought more than 10 copies of the paper since. It was said that over 7000 folks canceled in that time frame. They made no effort to bring us back and so it is. Fortunately I was gone by the time Christian Schneider came on board but I would have left rather than support the likes of him and the rest of the tone of the paper itself. Now get the Chicago Tribune and to date they have kept Garret out. My reason for not subscribing to JS is because I could not get reliable delivery at the different apartment buildings I’ve lived in. Also, it is impossible to find a newspaper box anywhere. Did they discontinue them all? I tried communicating with JS customer service about delivery issues but my problems continued. Namely, not consistently delivering the paper before I had to leave for work (at 6:15 a.m.). The Journal also has a policy against placing the paper in mailboxes (which would have been the safest possible option because papers lying loose tend to be stolen). Another option was to place it inside your door, but they never did this – too much effort involved, I guess. At one place I lived in, the paper was constantly stolen (and this was indoors). So, for the longest time, I purchased the paper from paper boxes. And then one day, they started eliminating those (just like the Postal Service eliminated theirs). Not all convenience stores sell the paper or if they do, they have a very small supply. I used to see papers passed around at work but haven’t seen this practice for many years now. Also, everyone on the bus had a paper. Now you might see one person doing the crossword and reading the funnies section on a very rare morning. I used to know a schoolteacher who did this – I don’t think she cared much about the rest of the paper. Maybe the paper could achieve a renaissance if it focused mainly on crosswords, advice columns, horoscopes, and comics!! I was never too worried about the political slant of the paper but what killed the paper for me was simply the inability to easily buy a paper in the morning due to absence of availability. Things were better when local kids had paper routes. Now, it’s all adults in automobiles (whom I think really need the money, chump change that it is). Also, they like to throw the paper toward your unit and not actually walk up to your place and place it there securely. Well, the good old days are never coming back and neither is the paper. R.I.P. It’s just all talking heads now on the national news and in primetime TV and radio talk shows. Also, anything that’s free on the internet is what modern readers want. No one wants to pay for anything any more (just like with music). So, journalism dies – go figure. This saddens me both as a member of the County Board, and as a person who’s been on many sides of the newspaper (and online news) game as a reporter, an editor, and in 2004, publisher of The Wisconsinite. I’ve railed in the past against media consolidation. That gave me an unusual opinion about the news and media. This is another eye into our public government, lost. In this time when the meaning of what a fact is is being distorted beyond recognition, we need more eyes reporting true facts, not fewer. I admit to being biased on this issue, but I think we need to support newspapers in general – even the skeletons of formerly great papers (the current J/S contrasted with the 1970’s – 80’s “Milwaukee Journal”) We need something to read, which we can hold in our hands and share with others in our circles. In the 70’s there was a program called DEAR (Drop Everything and Read) in some WI schools. The cooks and the janitors chiefly read newspapers. Some students and teachers read newspapers, too. The beauty of that program was that everyone stopped what they were doing and read. Neither of my parents completed high school, but both of them read newspapers in the morning and in the evening. I delivered the Detroit Free Press in the mornings and the Kalamazoo Gazette on the afternoons. We had intelligent discussions based on what we read. I do not expect THE ONION to resume life in print, but if it did it could inspire communal dialogue. Keep the printed word alive! What took them so long? Good riddance to bad Communist rubbish.